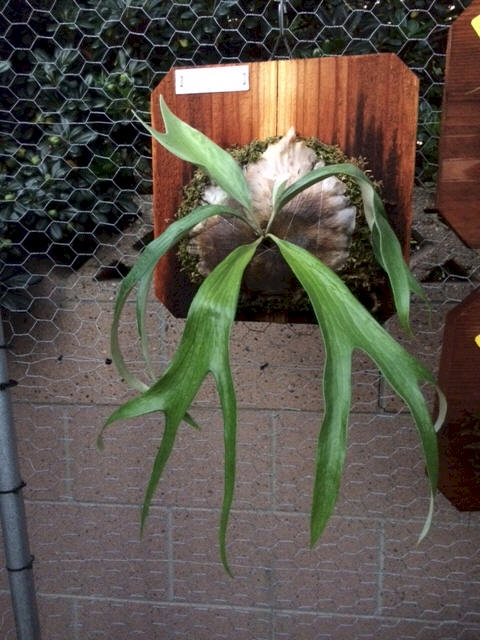 Photo; FernFactory.com which has this species for sale. 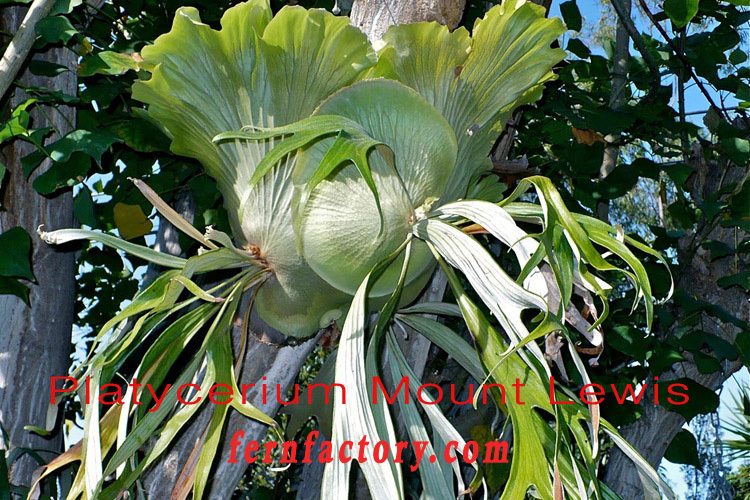 An under declared platycerium species is the P. Mt Lewis from the Mt Lewis National Park of northern Queensland, Australia. Mt Lewis National Park features plants dating back to the evolution of flowering plants on earth. Some flowers are indicative of Australia's link with the ancient landmass of Gondwana. It has not been determined if the P. Mt Lewis dates back to this period, but we do know that platyceriums do go away back in time. The P. Mt Lewis has also been called P. willinckii var. venosum. I can see the willinckii traits in the ratty looking narrow fertile fronds. The P. Mt Lewis was listed as a unique species, but current thought is the P. Mt Lewis is a cultivar of the P. willinckii species. The top photo and the photo on the right are good examples how the shield fronds grow outward forming a shade umbrella for fertile fronds. You might also notice the fertile fronds are quite broad compared to the top photo. A video Roy Vail gave me of platys he filmed in Australia show a Veitchii and Mt Lewis growing side by side in full sun. P. Mt Lewis should take a lot of sun, similar to P. veitchii and P. superbums. 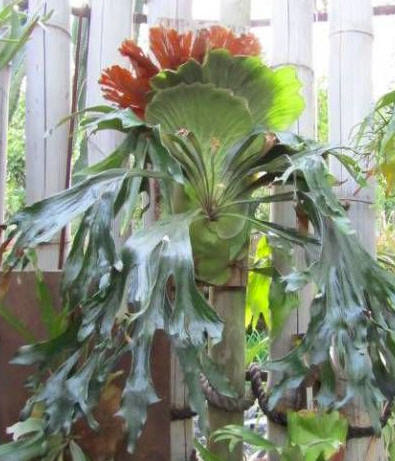 One person with possibly the largest collection of platycerium cultivars is Tom Gauchi of the Los Angeles International Fern Society. I visited Tom today and was very impressed with his collection. Many Bifurcatum, Hillii, Cass, Talnadge, Horn's, Veitchii, Wallinckii, Mt Lewis, Superbum, and many other platys beyond my ability to remember. He grows them outside with partial shade and no greenhouse. He acknowledges that with a greenhouse he could add many more species. He lives about 3 miles from the ocean and his climate is moderated by the ocean temperatures. The P. Mt Lewis on the left is described as a broad frond P. Mt Lewis. The photo on the right is a narrow frond M. Mt Lewis. Both platys are part of Tom Gauchi's collection. 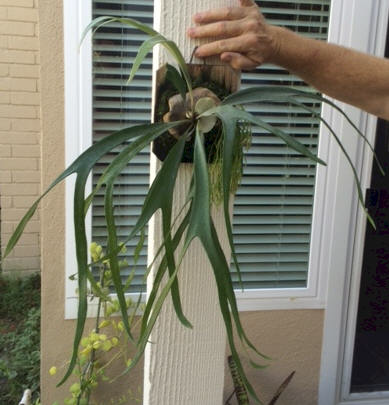 Tom tells me his collection tolerates temperatures from 100 to 32 degrees F.
My newest addition to my collection. Not sure if it is the broad frond or narrow strap like frond type. When plants are young, the true chrematistics are not always obvious.